If you'd like to download copies of my albums, three of them are available on iTunes here. You can purchase physical CDs below. All prices are inclusive of postage and packing to the UK only. 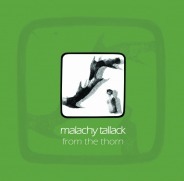 For overseas orders contact mail@malachytallack.com. Leaving My Old Self Behind E.P. Limited edition Country & Northern CDs are now sold out, but you can download the album for free. To order a copy of From the Thorn for £11 click a button below. To order a copy of Edges & Spaces for £11 click a button below.